Female Cheetahs have been known to catch live prey for their cubs to use as hunting practice. 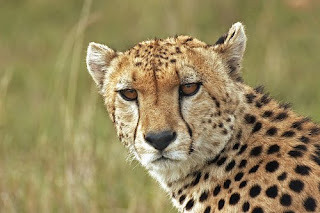 The Cheetah makes facial expressions, using the bold black lines around its muzzle to signal its mood. From a standstill, the cheetah can reach its top speed in about 3 seconds, and can cover almost 33 inches in a single stride. Cheetahs don't need to drink water, as they get the moisture they need from the bodies of their prey. The cheetah cannot roar like other big cats. However, it can purr while inhaling. Unlike other big cats, Cheetahs cannot climb trees and have poor night-vison.